I've heard a lot of people complain that some of Archer Farms dinner pizzas don't have enough toppings. I've never really felt that way. I always thought my toppings were plentiful enough, and even if there was a patch of my pizza that seemed a little bare, the crust was tasty enough that I didn't really care all that much. 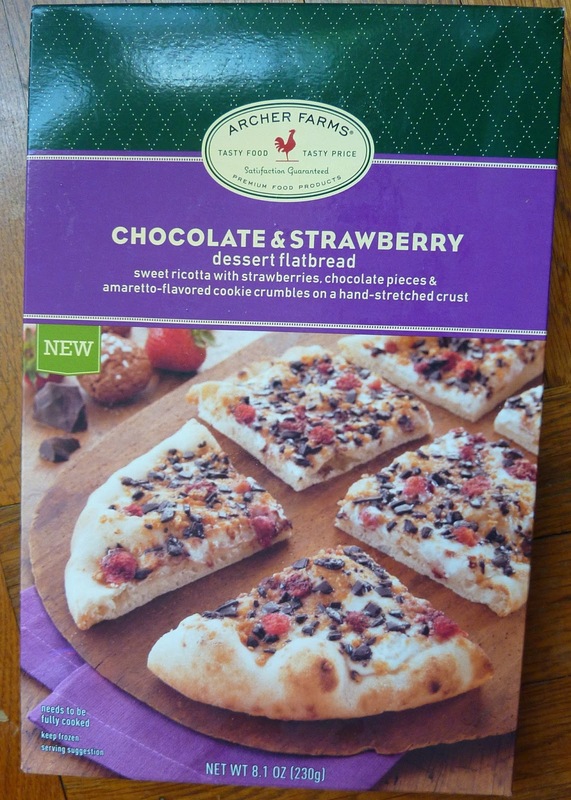 But with this dessert flatbread, that's definitely my main complaint. Not enough of the toppings. The crust is still good, but it's really a pizza crust. And to me, for some reason, that doughy, crispy bread doesn't quite work as a dessert by itself in the same way that it goes with dinner by itself. It's like one bite is a delicious, creamy, warm strawberry pastry, and the next is just...a plain old breadstick. Again, I don't mind breadsticks, especially with a traditional pizza. But if you yanked an amazing strawberry chocolate dessert out of my hand and replaced it with a dull, boring slab of baked dough, I'd be upset. That's kind of what we have here. It tastes great. At least the bites that had some toppings on them. But there were plenty of bites that didn't have any toppings at all. That could be an issue that varies from flatbread to flatbread, and I just happened to get one of the more sparsely-topped specimens. But I have to score the item I actually got to eat. Well, I suppose this item was tasty enough, even considering the lack of toppings, that I'd tell you to try it anyway. The chocolate and strawberry flavors aren't overbearing at all. In fact, I think I detected the sweet ricotta and amaretto crumbles just as much as the strawberry and chocolate. That's just fine with me. The bites that contained all the ingredients were balanced and delicious. This one is more dessert-ish than the Pear & Gorgonzola Flatbread. It's definitely sweeter. I'm a fan. It's great either piping hot out of the oven or chilled in the fridge. Try it both ways.